Instant Pot Jambalaya is made in less than 30 minutes from start to finish this one pot meal will become a family dinner favorite! 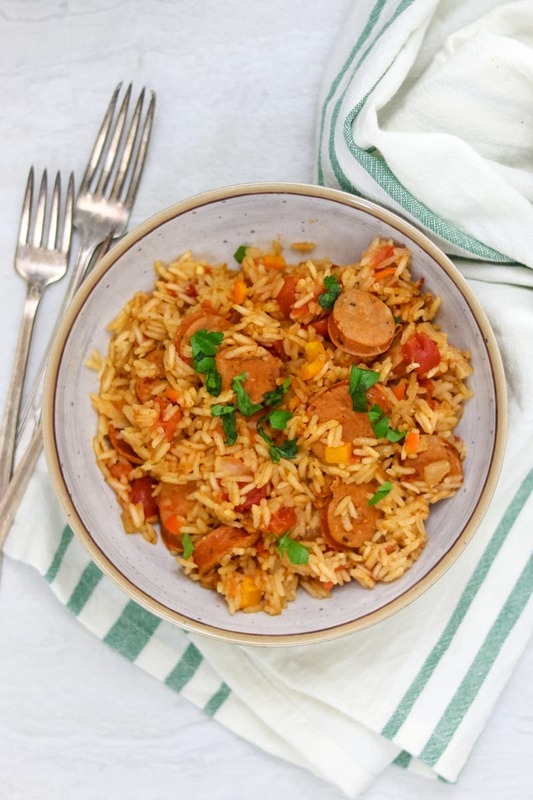 Spicy chicken sausage is the star of in this easy recipe for Cajun Jambalaya that sings with Creole flavors. I am coming at you with another easy 3o Minute Family Meal today, because I know that you, like me, are running around like a chicken with it’s head cut off, just try to survive the daily grind. Am I right or am I right?! Speaking of crazy schedules, let me tell you this past week has been a bit crazy. Between doctor appointments, track meets, an open house for a new school we are attending in the fall, and dance recitals, I am beat. And we have been eating lots of quick meals to avoid the drive-thru. We had 15 Minute Black Bean Tacos after dance, slow cooker chicken chili after a day of clinic appointments, grilled panzanella at track practice, and this Instant Pot Jambalaya before open house. Friends, let me tell you this easy Cajun jambalaya was not only a life-saver for a busy night, it was SO delicious! Full of spice, juicy chicken sausage, and perfectly cooked rice, this simple recipe will seriously become a new go to at your house. My son asked if he could trade out his favorite PB & J Oatmeal Muffin for this Jambalaya for his school lunch. And that is saying something! Before you comment, I do know that this is not a traditional recipe for Jambalaya, nor is my stove-top Quinoa Jambalaya. But you know, I am not a traditional kind of gal when it comes to Jambalaya. My instant pot jambalaya recipe has no shrimp or chicken. BUT there is chicken sausage! 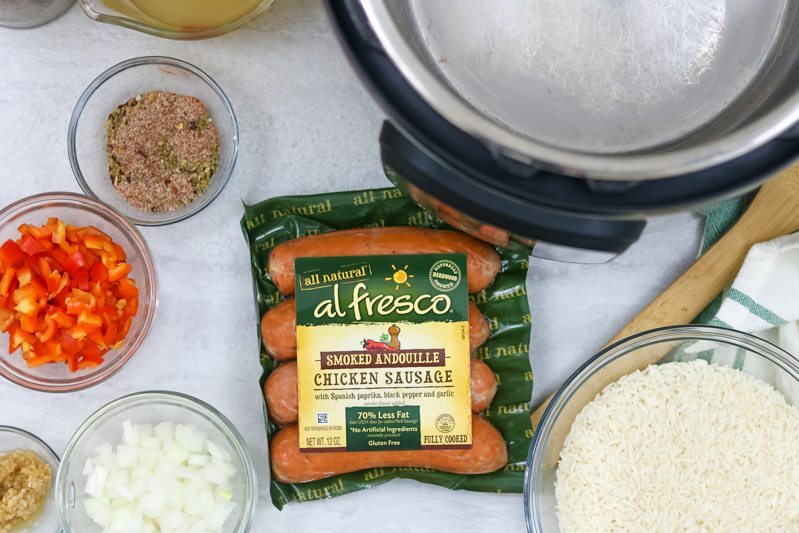 And the smoked andouille chicken sausage from al fresco is the PERFECT compliment to Jambalaya, as it is the perfect compliment in Cajun Chicken Pasta. I seriously am in love with all the flavor packed into this sausage. This jambalaya could not be any easier to throw together. Just a few ingredients and a short amount of time in the pressure cooker and dinner is done! The key to this fast jambalaya is of course the pressure cooker, but also flavorful ingredients in way of the sausage and Cajun Seasoning. The only step that takes any amount of time waiting for the instant pot to come to pressure and to release. But even with that time accounted, this recipe only takes 30 minutes start to finish. Saute the peppers and onions in a bit of oil on the saute function. Feel free to skip this step and just dump them in and cook on high pressure to make this recipe even easier. Add in chicken stock and scrape up any browned bits of food from bottom of the pan. Add in garlic, diced tomatoes, sausage, and Cajun Seasoning and stir. Add in rice and gently push down with back of spoon to submerge rice into liquid. DO NOT STIR RICE! Allow to naturally release. It is really important to allow the pressure cooker to release pressure naturally when cooking rice, to be sure you have tender, fluffy rice. DON’T skip this step! Fluff rice with a fork and stir in Worcestershire sauce and hot sauce and serve Instant Pot Jambalaya. Be sure to RINSE your rice, as this will help it not stick to pressure cooker. If you do want to add shrimp to this jambalaya recipe, you can add frozen shrimp to the right before sealing and cooking. Frozen shrimp takes about 4 minutes to cook, but because you are not doing a quick release, the shrimp will cook in 3 minutes. If you have picky eaters, leave out the onions and/or peppers. This Jambalaya will keep in the fridge for 3 days or it can be frozen for up to 3 months. If you don’t like the texture of diced tomatoes, use tomato sauce or crushed tomatoes in place of the diced tomatoes. This recipe is written to cook on high pressure. Please DO NOT use the rice function on your pressure cooker. Be sure your Worcestershire sauce is gluten-free if you need this to be Gluten-Free Jambalaya. Because I am using precooked, chicken sausage, I chose to use Jasmine rice, which only cooks in 3 minutes. You can use brown rice. Just increase cooking time to 25 minutes on high pressure. 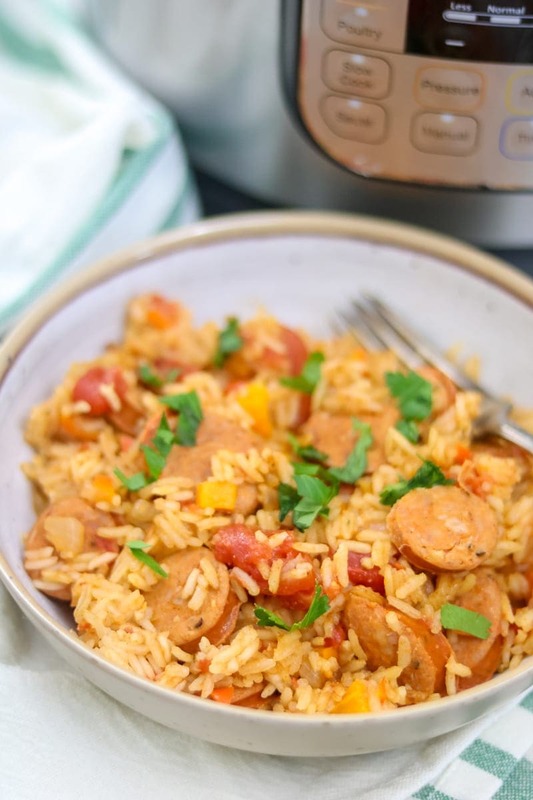 Spicy chicken sausage is the star of in this easy recipe for Instant Pot Jambalaya that is made in less than 30 minutes from start to finish. Turn Instant Pot to saute mode on high and allow to heat up. Once heated, add in oil, onions, and peppers and saute for 2-3 minutes until just beginning to soften up. Add in chicken stock and scrape up any browned bits of on bottom of inner pot. Add in garlic, Cajun seasoning, sausage, and stir. Add in tomatoes, and gently stir. Add in rice and gently push down with back of spoon to submerge rice into liquid. DO NOT STIR RICE! Put lid on Instant Pot. Cancel saute function and set to high pressure on manual (or pressure cook function) and set timer for 3 minutes. Let pressure release naturally and then stir in Worcestershire Sauce and hot sauce. I’d love to add shrimp to this recipe…any ideas on when and how? Thanks! Hi Angela!! In my tips I share how to add shrimp: If you do want to add shrimp to this jambalaya recipe, you can add frozen shrimp to the right before sealing and cooking. Frozen shrimp takes about 4 minutes to cook, but because you are not doing a quick release, the shrimp will cook in 3 minutes. 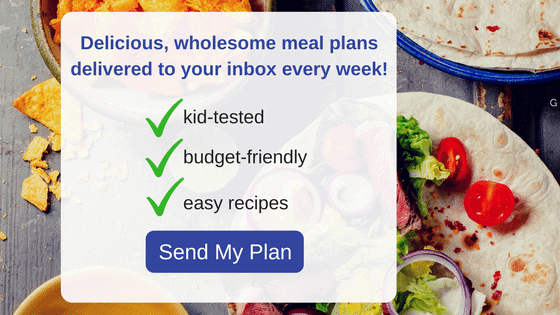 Everyone needs quick and easy recipes to get through our busy weeks! This looks perfect! This looks INCREDIBLE!! I’ve been craving a jambalaya! Well this recipe will satisfy that craving in NO time! So easy in the Instant Pot! This is a great dinner for busy weeknights! Easy dinner for the win!! This recipe saves me on busy nights! It says mix in the garlic but garlic isn’t listed on the recipe! Great catch Jeremy! Sorry about that. It is 1 teaspoon minced garlic. Correcting that now. Instant pot recipes are just the best! They always seem to amaze me! I agree Krista–it is quite something to watch dinner come together so quickly! Love how quickly you can make this recipe! Yum! It is perfect for a weeknight! I love jambalaya and any chance for me to use my crock pot!! Thanks for sharing!!! 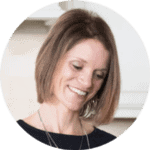 Hey Jocelyn–so it can be tricky to cook rice in the instant pot. It can be done, but for this recipe, I would recommend cooking on the stove-top instead if you don’t have an Instant Pot. This looks like it has SO much flavor! I need to get an instant pot asap! 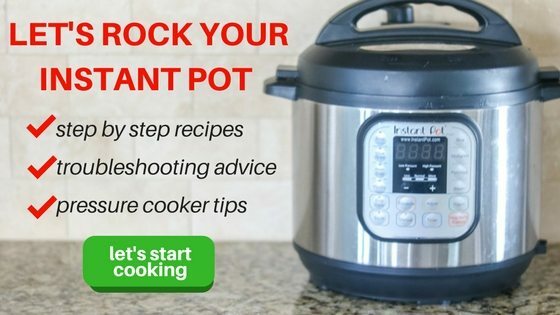 This makes me want an instant pot! 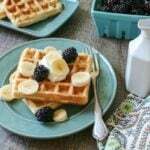 quick and easy recipes this is what i am looking for thank you for sharing the post ,I am definitely going to try this! This turned out delicious! I misread the ingredients and put in 1/4 C of stock instead of 1 1/4 C so I had to add more and cook a little longer. Still, great flavor and super easy. Despite you mistake, I am so so glad this turned out. We absolutely love it for it’s flavor and ease! Thanks for sharing your success. This looks amazing! I love that you used chicken sausage, my family loves them. I can’t wait to try your recipe! Your family will adore this then Audrey–this sausage is flavored perfectly. I love a great Instant Pot meal! This is a great jambalaya recipe. I am a huge fan of Al Fresco sauce. Great flavors without crazy calories. This has been added to my families dinner meal rotation. YAY!! Enjoy Eileen! I agree. Al Fresco Chicken Sausage is unbeatable in taste and quality! 25 min for brown rice is not enough time, or 1.25 cups is not enough liquid. Came out tough. Hi Jim! I am sorry you had issues with the rice coming out tough. I will try this recipe again with brown rice to see how I can adjust it for the future. The liquid should have been more than enough, since there was also liquid in the diced tomatoes. It may have also been the brand of brown rice if it was older. Again, I am sorry you had issues. How long for the NPR? Can pre-peeled fresh shrimp be added in place of frozen shrimp? If so, how long should I cook them? Hi Rhonda! Fresh shrimp cooks in only 1 minute. So while you can use fresh shrimp, it would be overcooked. You could also cook the Jambalaya as directed, then add shrimp and cook for 1 minute on high pressure longer. Hope that helps! This recipe is fantastic, and so easy. If I want to freeze leftovers, how do I reheat? Hi Kaz! I am so glad you enjoyed this recipe. To reheat, you have a couple options. My instant pot kept giving me the burn alert during preheating for the pressure cooking. 🙁 it cooked and absorbed the liquid during that process anyways (getting ready to sit down and eat — it smells wonderful!!). Any ideas or suggestions to avoid this next time? Hi Noosheen, Sorry for your burn warnings. Did you remember to scrape the bottom of the instant pot after adding chicken stock? Sometimes after sauteing veggies, browned bits of food may cause a burn warning. I hope you were still able to enjoy dinner! I had the same issue – there was nothing burned to the bottom of the pot when I added the stock, but it seemed like the rice burned to the bottom when it was getting up to pressure. Hi Anna, I am so sorry for this issue–did you get an actual burn notice or just rice on the bottom after cook time? Can I ask what Instant Pot model you used and what type of rice you used? It may also help to rinse the rice before adding the pressure cooker. Let me know so I can further trouble shoot for everyone. Thanks! This looks delicious! Just bought all the ingredients, but I’m wondering…you mentioned you used pre-cooked sausage in the instant pot. If we use uncooked sausage, would this recipe still work? If so, how long would we set the timer for? Thanks so much for your recipe and creativity! Hi! We have a large family gathering. Can this recipe be doubled?or would I need to do it twice? More liquid? Time? Thanks! Hi Tamara, you can double this recipe as long as it fits and doesn’t fill the inner pot past 2/3rds full. The timing will remain the same, but coming to pressure will take longer, as will natural release. Enjoy. Okay, this was my first recipe ever! I look a little over 20 min to naturally depressurize and everything is mush. Any tips on what I could have done wrong? I followed your recipe completely. Oh I hate this was your first recipe Pamela and you did not have success. Can I ask what kind of rice you used? And 20 minutes seems like a LONG time for this amount to depressurize. The longest mine has taken is just over 12 minutes. Let me know and I can think on how to improve in future for you so you can enjoy a delicious (non-mushy) meal. Hi Cody, my guess is that you did not fully scrape off the browned bits from sauteing the onions and peppers. That step is crucial to avoid a burn warning. Hope that helps. I loved the recipe it was fantastic, but noticed you put the total time as 8 mins something does not add up there. I am sad for you too Eileen! It was good to rinse your rice, next time maybe try scraping up browned bits on bottom of pressure cooker. YAY! So glad this recipe was easy and a winner for you Tamela. I made this recipe with brown rice and cooked it 25 minutes and rinsed the rice first as recommended. It was wonderful we loved it. I love hearing that Melissa! Thank you for taking the time to share your review. Ready to try out this recipe! Looks yummy! What brand of hot sauce do you recommend? Thanks! I love Franks or the store bought version 🙂 I hope you enjoy!